Dewa Sacred Mountains is one of the most important religious holy place in Yamagata Prefecture. There are 3 mountains, Mt. Haguro, Mt. Gassan and Mt. Yudono. The faith of Dewa is based on Shugendo and mountains. The history of Dewa Shrine is very old. In the middle of 6th century, these shrines of Dewa was established. Mt. Haguro (羽黒山) is one of 3 Dewa Sacred Mountains located in Yamagata. It is 414m tall mountains and the entire mountain is Dewa Shrine. The faith of Dewa is based on Shugendo and mountains. The history of Dewa Shrine is very old. In the middle of 6th century, these shrines of Dewa was established. There are many historical buildings such as 5 stories pagoda, the national treasure of Japan. 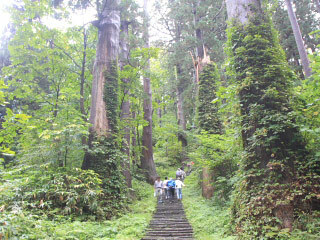 The trail that is also the leading road has 2446 stone steps, and it is about 1.7km long.This main leading road is surrounded by over 500 years old Cedars.It was used to be a practice place of for Shugendo for long time. Today, many people still worship this mountains. 1. use JR Uetsu Line to Tsuruoka Station. 2. use local bus to Hagurosan.